Sometimes it's hard to find the courage to do things that we don't want to do. I'm talking about big things here, like standing up when you know others will do their damndest to tear you down, to discredit you; to share a life altering experience in the face of ridicule; and to relive trauma. I asked the Runes to offer insight into how to not only find that initial courage, but to get through the entire process. The Runes were spot on in their guidance. They gave me Tiwaz, Perthro, and Hagalaz. I really like the order in which these are presented, because rather than give me Hagalaz first, which would have started us off on a low note, the Runes offered empowerment in Tiwaz. Tiwaz is Týr's Rune and it has three strong aspects to it - Týr as a warrior, Týr as a sky god, and Týr's sacrifice. Starting with the latter, in this instance, a sacrifice was made once (in the past) and now a different kind of sacrifice must happen, one that is tied directly to the first. This is the requirement or decision to take a stand. As a sky god, we have a bird's eye view of the situation. This means that we can see how all the various parts of the situation come together. It gives us an understanding of things so that we can be strategic, prepared. Finally, as a warrior, we are reminded that we can persevere, because being a warrior is about far more than hand to hand combat. Through this single Rune with these three different, but connected aspects, our individual courage is brought to light. Perthro, in second position, reminds us that we are not alone. While our friends may challenge us at times, true friends support us through hard times. In fact, it is often said that in hard times, we find out who our true friends really are. I would take this a step further to say that beyond friends who support us, there are strangers who share our experience, who understand what it means and the courage it takes to stand up, and they support us as well. When we have a wavering moment, we can remember that not only do we have our own courage to rely on, but that we have the support friends and unknown others. This is important to remember, so that when the hail storm of Hagalaz hits, we can weather it and come out on the other side knowing that we did what we needed to do. 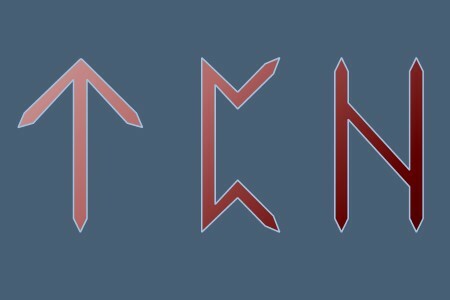 This is why Hagalaz is in the third position; the first two Runes prepare us to be hit by the hail and to not only survive, but come out on the other side with new potential. Remember, when hail melts it provides nourishment from which new things - ideas, perspectives, opportunities, etc. - can blossom.